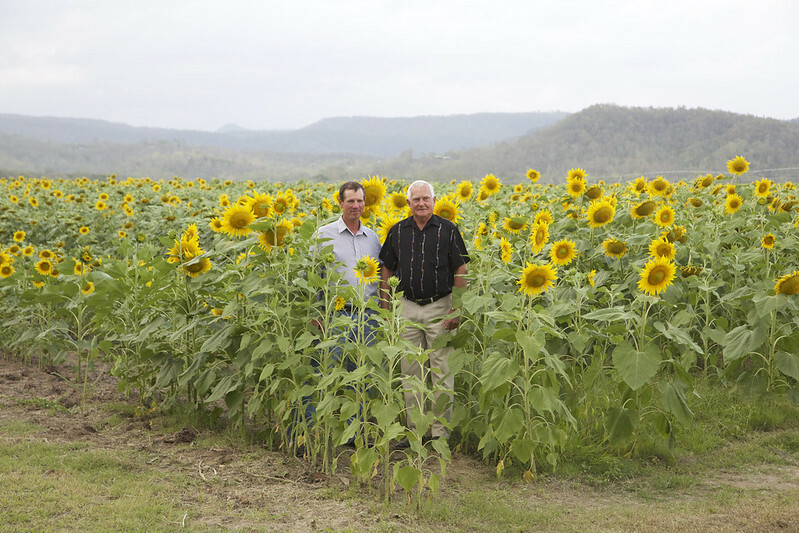 Sunflowers as agricultural and cultural change agents – Sugar vs the Reef ? This is unusual – the sugar cane industry generally deploys cane as a monoculture. Sometimes a legume (soy beans for example) are planted as a rotation crop at the end of the sugar cane’s ratoon cycle, but the idea of planting something else in amongst the cane is (depending on how you look at it) quite new, or very old. The sunflowers pop up very quickly to take advantage of the available sunlight. 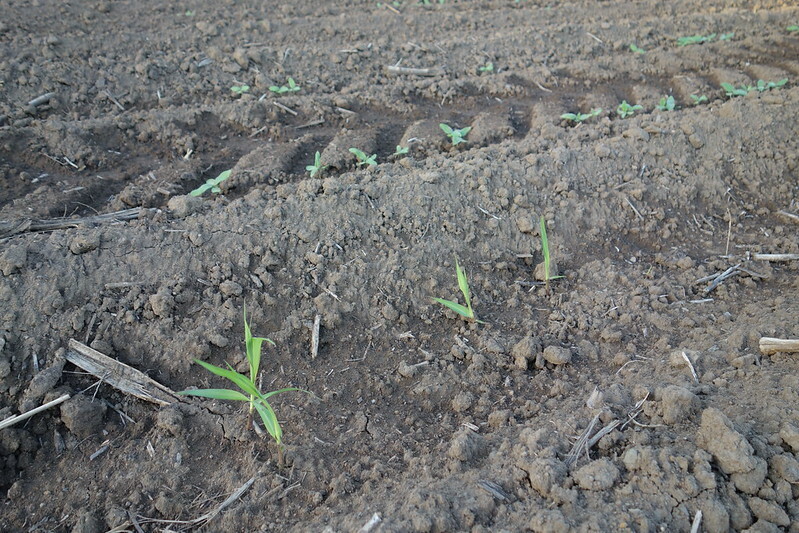 Annual plants like sunflowers grow much faster than perennials like sugarcane in the first 3-4 months after planting. 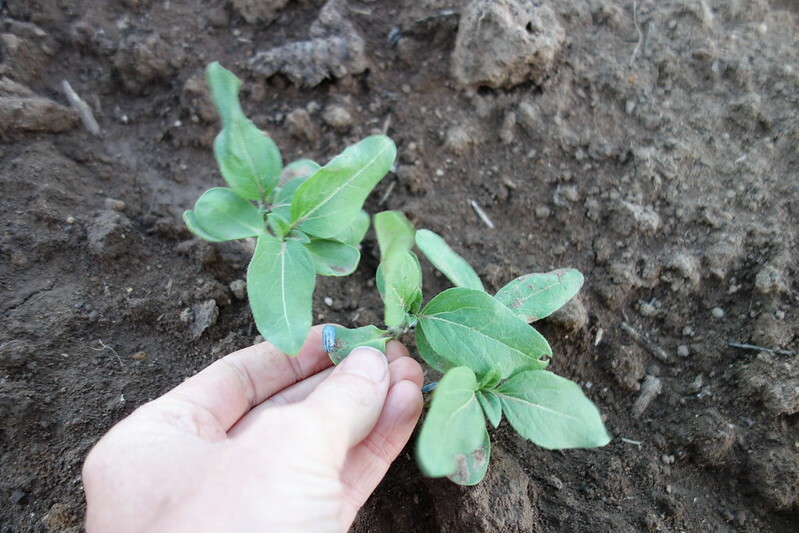 The sunflowers also shade the soil, suppressing the emergence of weeds. 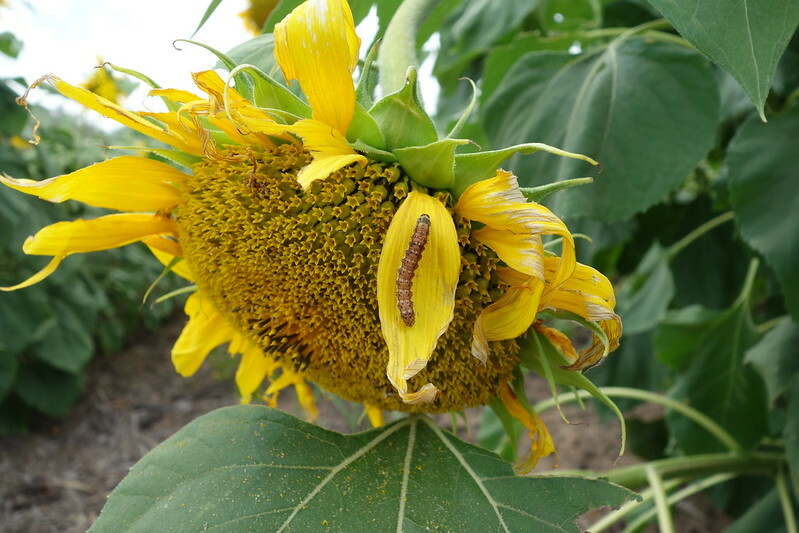 The sunflowers assemble their own sub-soil community (nemotodes, bacteria, fungi, animals) which flourishes around their roots in the rhizosphere. This is a different rhizosphere community to that which accompanies the sugar cane roots. This diversity (two subsoil communities instead of one) helps prevent the build up of the pest species which seem to follow monoculture crops. Hence, pesticide use can be reduced. By late November – early December, the sunflowers are ready to harvest. At this stage, the sugar cane is only half grown, so you can harvest the flower heads over the top of the canestalks without disturbing them. Thus you get two harvests from the same field. After harvesting the sunflowers, their stems can be left in the field to form part of the biological matter mulching and enriching the soil, and further supporting the growth of the cane. Next year, the cane can be harvested as normal. At the harvest, check the sugar-per-tonne levels of this yield to see if the dual crop has had a positive effect. In theory, the increased diversity in the sub-soil ecosystem, and the addition of more biological matter to the field, should result in an increase in soil carbon. This would perform carbon sequestration in the soil (carbon dioxide having been pulled from the atmosphere for the building of the sunflower plants). A boost in carbon content also makes the soil more “spongy”, so it can better retain moisture, requiring less irrigation and producing less run-off to the reef. The other thing about sunflowers is that they have cultural (not just agricultural) value – they are beautiful! Just being around them makes you happy. 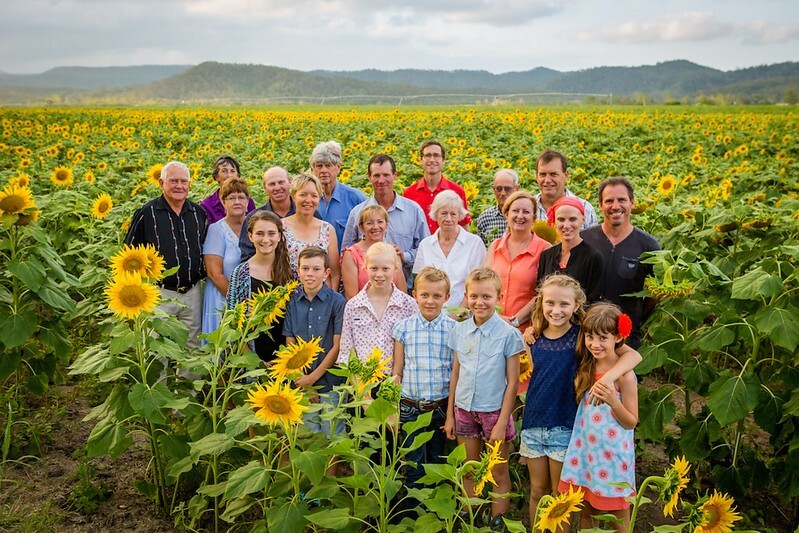 Last year, people were stopping their cars to take selfies with the sunflowers, and Mackay photographer Summer Rain got a bit of business shooting wedding photos and baby photos on Simon’s farm. Simon has begun to realise the value of aesthetics. A sugar cane plantation (unlike, say, a grape vineyard) does not ordinarily possess an aura of romance. It’s a functional crop, an industrial crop. 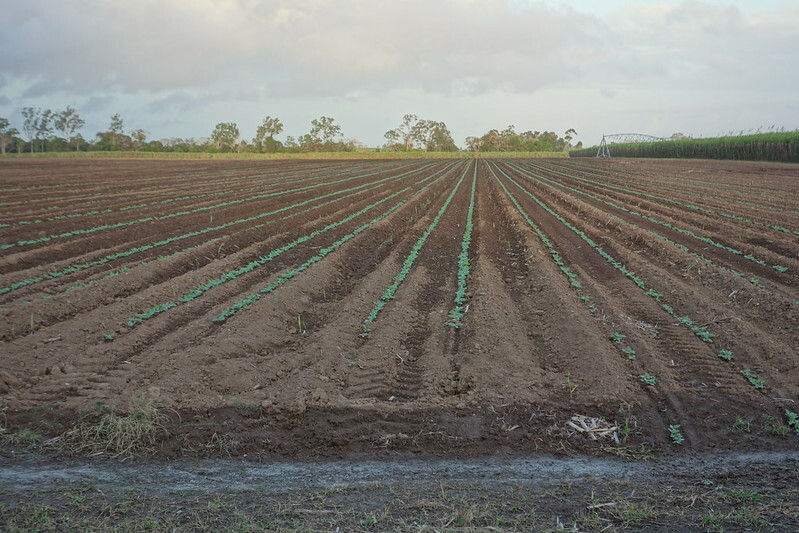 People in Mackay frequently refer to it as the sugar cane industry. To my mind, this language turns the paddock into a sort of factory. At this point, you’ve got them! Now a discussion begins about how to farm better for the health of the soil, and who knows where that might lead. This blog post was included in the FUTURELANDS2 Newspaper published by Kandos School of Cultural Adaptation (KSCA) in April 2017. Read the article here.